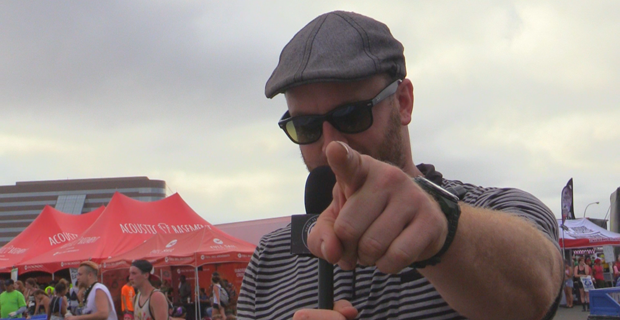 It is safe to say that Brian Marquis has paid his dues on Warped Tour. The multi-tasking man behind the Acoustic Basement stage has been spending the summer performing songs, running a stage, drinking whiskey and even battling lightning. Thank the music Gods that Marquis is safe after his run-in with electrocution, which is something no one wants to encounter. Under The Gun is proud to announce Brian Marquis as the artist chosen for our eighth installment of our UTG TV Warped Tour interview series. Brian has flourished as a solo artist despite transitioning from a much more hectic style of music in Therefore I Am. Check out the exclusive chat below the jump to hear about Brian’s work running the stage, his upcoming solo album, his covers and collaborations, and why work ethic is an important part of his life.